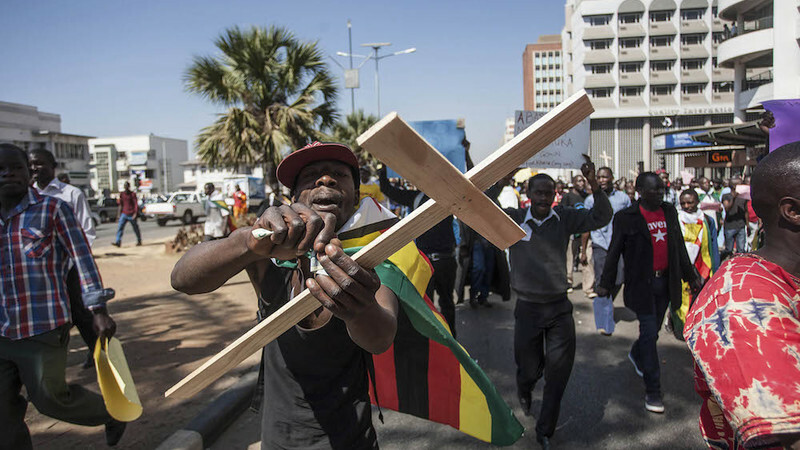 Zimbabwe has a history of elections that are far from free and fair — and several ominous developments suggest that nothing will different at the end of July, when the country votes in the first election since the resignation of Robert Mugabe. Of particular concern is the apparent complicity of the Zimbabwe Electoral Commission (ZEC), which is issuing controversial new voting regulations that undermine the secrecy of the ballot. As in previous polls, the commission has become increasingly obstructive to engagement as the elections draw closer. Another major worry is the unconstitutional nature of the ballot itself, which features two columns, with President Emmerson Mnangagwa’s face at the top of the right-hand column. Although the ballot should have been in alphabetical order, it is not — apparently to allow the president to occupy the prime position at the top. This attempt to give the ruling Zanu-PF an advantage and has been roundly criticised by opposition parties and civil society groups. It is a blatant example of partisanship and undermines the last vestiges of ZEC independence. In a shock new change, the Zimbabwean Electoral Commission (ZEC) is to adjust the electoral protocol in the ZEC elections handbook to reposition the country’s voting booths. The proposed changes mean that voters will cast their votes in full view of electoral officials and party agents. This fundamentally undermines the secrecy of the vote and is in contravention of international standards as laid out in all major treaties to which Zimbabwe is a signatory. The decision to turn the voting booths around so that they may be observed by electoral officials has been justified by ZEC as a necessary measure to discourage voters from taking photographs of their ballots while in the booth. Previously, booths faced the wall to enable voters to cast their ballots without being observed. The secrecy of voting choices has been a longstanding concern for the country’s electors. In previous polls, many reports surfaced of voters in rural areas being forced to line up behind traditional leaders — who are largely aligned to the ruling party. These voters were given numbers so that ballots could be traced back to voters according to their position in the queue. Ahead of 2018, despite the introduction of the more secure BVR system, numerous reports surfaced of Zanu-PF officials or traditional leaders demanding the registration slips given to voters by ZEC. The barcodes of these slips were then reportedly recorded, while officials told voters that their voting choices would be traceable to their registration slips. An Afrobarometer survey released in June 2018 (conducted in April and May) found that 33% of rural residents and 26% of urban residents had someone demand to see the serial number on their registration slips. Thirty-one percent of those surveyed thought it was likely that ‘powerful people’ could find out how they voted in the upcoming elections. The new protocol around voting booths will exacerbate this feeling, and it fundamentally undermines the already precarious secrecy of voting in Zimbabwe. Although the election is scheduled for July 30, on July 12 reports emerged on social media of police officers voting in police camps in Bulawayo. When these reports were taken up by the opposition, they were rubbished by ZEC’s acting Chief Elections Officer who referred to the claims as “hogwash” and “cheap propaganda.” ZEC said that they were still processing postal ballot applications, meaning that the police officers couldn’t possibly have the necessary ballot papers to vote. But the same day, the Zimbabwean Republican Police confirmed the reports, saying that the police officers were voting via postal ballots as they were to be mobilised on election day. It emerged that the police had been in control of the process, apparently without ZEC involvement or knowledge. No members of the public were informed of this special vote, ZEC appeared not to be in control of the process and no observers or party agents were on hand to validate the election. This raises many questions about whether ZEC was really in control of these elections, and whether they are being honest with the public and about how police officers accessed the ballots. On July 16, an anonymous team of volunteers dubbed Team Pachedu – ‘we are there for each other’ in Shona — released a massive report on the 2018 voters’ roll. It found more than 250 000 namesthat are either wrong, duplicates, invalid, or statistically improbable. This is particularly concerning as the ZEC had heralded the use of Biometric Voter Registration (BVR, recently employed in Kenya and Nigeria) to create a brand new voters’ roll from scratch. This was deemed necessary due to the vast problems with the 2008 and 2013 voters’ rolls, which the auditors and opposition claimed had been manipulated to include tens of thousands of deceased and incorrect voters. The BVR was widely heralded as a ‘new start’ for delivering a credible voters’ roll that couldn’t be manipulated, by forcing voters to appear in person to register and provide fingerprints and photo ID which would be used for verification on voting day. Since the finalisation of the roll, however, ZEC has consistently delayed releasing the roll to parties (having finally done so long after the constitutional deadline), and refused to allow an independent audit. The commission stated that parties could conduct their own audits, at their own cost. Enter Team Pachedu. The huge report outlines, in meticulous detail, how Zimbabwean ID numbers are generated, and which parts of the number must be unique to each citizen. Given the uniqueness of these numbers, and the use of BVR technology to create the roll, it would be expected that there would be few or no duplicate ID numbers or voters on the roll. However, the report finds 122 788 ‘statistically improbable’ voter ID numbers, in which people with the same surnames share the same middle ID numbers across different districts – something that should not be so prevalent, given how the ID numbers are generated. Taken together, the four issues outlined above paint a worrying picture of the upcoming polls. Given that there are now less than two weeks to go, it is crucial that ZEC engages with the opposition and the public to allay fears about the fairness of the elections. They must reverse their changes in election booth facing, to preserve the secrecy of the vote and ensure the integrity of the elections. A failure to do so will undermine Zimbabwe’s post-Mugabe future before it’s even really begun. Nicole Beardsworth is a political analyst and postdoctoral research associate at the Interdisciplinary Global Development Centre (IGDC) at the University of York (UK).